Longtown Historical Society was established in 1971 to promote knowledge of local history in an area of southwest Herefordshire between the Golden Valley and the Black Mountains. 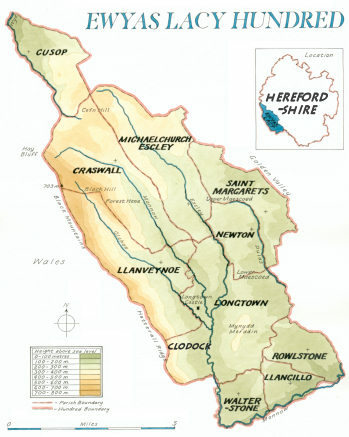 This includes much of the ancient Hundred of Ewyas Lacy, now centred on the village of Longtown. Until the reign of Henry VIII, this area was part of the March, controlled by lordships whose borders often changed. When the frontier with Wales was defined in 1536, Longtown found itself on the English side. It has the ruin of a Norman castle with its circular keep and inner bailey still readily accessible. Elsewhere in the parish there is the remains of an earlier motte, while the parish church with its dedication to St Clydawg reminds us of our Welsh roots and its pre-Norman Conquest foundation. The Society with a membership of about 80, holds monthly meetings on the first Monday of each month between September and April in the village hall. Talks are given by speakers, usually on aspects of local history but, from time to time topics of a wider historic context are included. During the summer months a couple of field trips are conducted and in July the Society's AGM is held.